At TheSKyKid.com we are devoted to the promotion of young talent from across the globe. 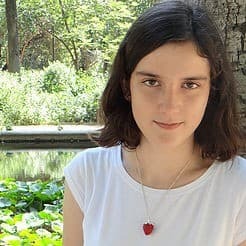 We were recently contacted by Sara Martin, an inspiring young actress from Spain and, as a result of our research on her, it’s a privilege to introduce her to our readers. Sara Martin is a 14-year-old actress from Barcelona, Spain. She really likes acting and sharing her passion for performing in front of others. This interest came to her when she was only seven-years-old and she immediately decided to explore this world by beginning to take drama lessons. She especially likes comedy and making people laugh, smile and have a good time as she believes that finding happiness should be important in everyone’s life. Together with the Fandino twins, Jacob and Nolan, who were first introduced to the readers of TheSkyKid.com in February, 2016, Sara has released an inspiring video highlighting the importance of believing in one’s dreams. She likes to consider herself a future motivation speaker, since she’d love to inspire others and make them see the bright side of life. Sara started to post videos on YouTube in May 2015. Recently, having discovered a love for music, she’s hoping to be able to sing in public soon. To continue growing as an artist and to take part in different projects are her future plans and hopes. When she is not acting, Sara’s many interests include listening to music (she’s a huge fan of many musicians), singing, dancing, watching TV shows, traveling, drawing, surfing on the internet, ice skating, playing the guitar, and cooking. You can find out more about Sara by visiting her HomePage and YouTube Channel.